Above you see our tree after 1 week of family musings around the dinner table. At the beginning or end of our meal we each pick out a colorful leaf and write something we are grateful for before hanging it on the tree, which is mounted to a wall behind our dining room table, where we see it throughout the day. It’s beautiful, and makes me smile whenever I look at it. Ella usually tells me she’s thankful for trees, rocks, food, chocolate cake, or whatever happens to be in her hand at the time. Josh, my husband, is thankful for things like puns. I usually write something which made my day happier, like walking on the cold beach with my daughter, or getting to listen to 2 hours of radiolab while Ella was in preschool, or dance parties, which are invaluable when I’m parenting alone for a full day and night while Josh is busy with grad school projects. It really doesn’t take long to see a tree full of leaves and gratitude. Step 1: Gather empty thin cardboard boxes, such as cereal or kleenex boxes, a sharpie (I use a thin tipped sharpie) and scissors. 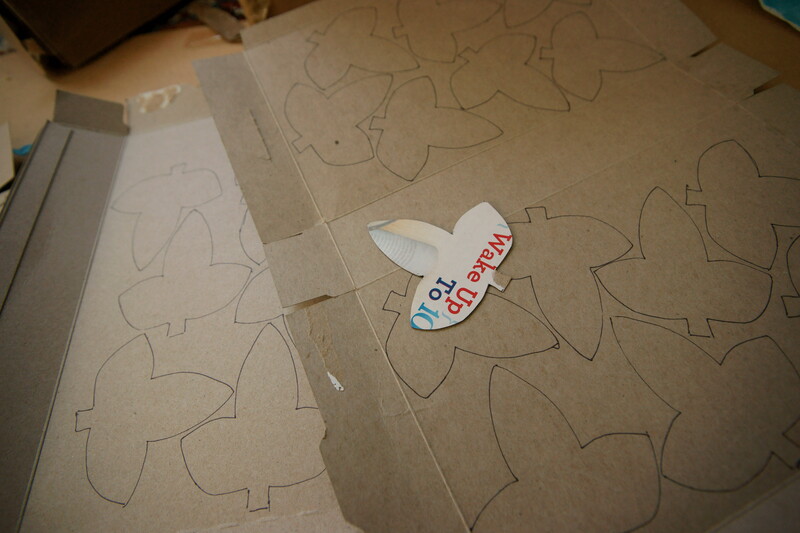 Use a pencil, pen or sharpie and draw a leaf pattern you like and cut out ONE to use for tracing. Don’t make it too complicated because you’ll want to make lots of leaves and will have to spend some time cutting them out. In this picture you’ll see I made two leaf patterns and went with the three tipped leaf. 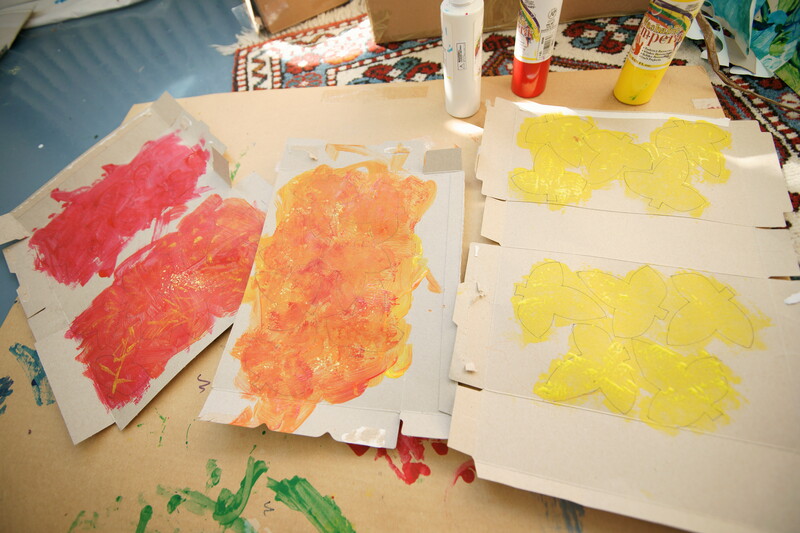 Step 3: Using tempera paint, cover your leaves in fall colors. We mixed paints right on the cardboard and had fun experimenting with different brush strokes to make interesting patterns. 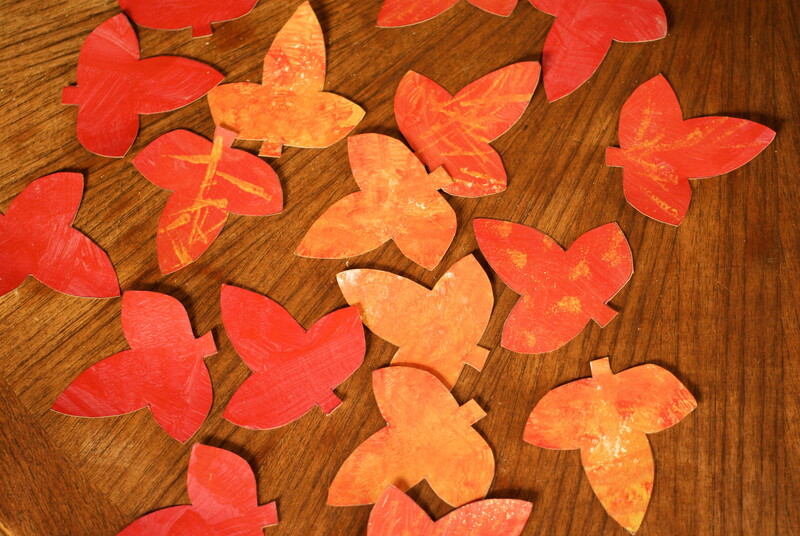 We also grabbed a piece of yellow chalk (totally optional) and scraped some chalk dust onto the red and orange leaves while the paint was still wet – makes it look like pollen and gives it a great texture. I wasn’t crazy about the color yellow we had after one coat, so for the yellow leaves I added a bit more yellow, and one drop of green on some of the leaves and using a palette knife (a finger laid flat or a pencil should work as well) swirled the colors, incorporating just a little green to make them more vibrant. You can see the result in the completed leaf pictures below. Allow to fully dry before cutting. 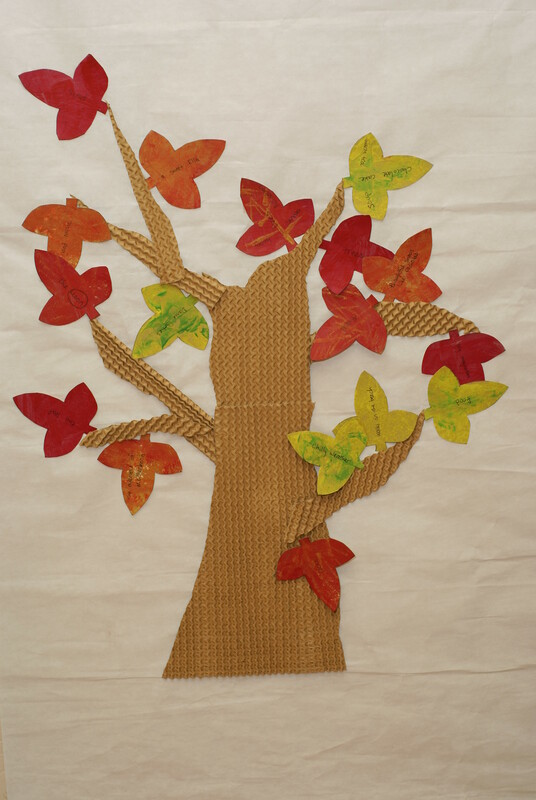 Step 4: While the leaves are drying, create a tree trunk with branches for your leaves to adorn. I used one of those thin corrugated cardboard papers liquor stores place around a bottle of wine to protect it. 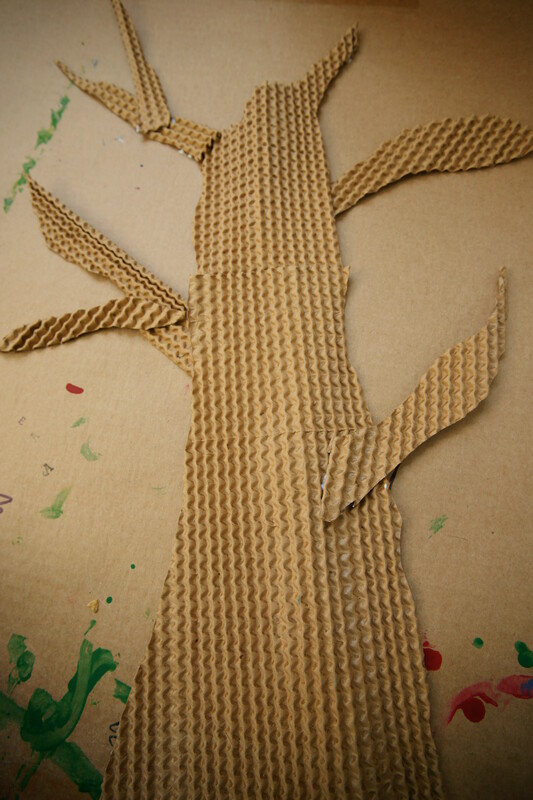 You can use anything – another cardboard box painted brown, felt, fabric, whatever you have lying around the house. Make the tree trunk large – it fills up fast. I probably should have added more branches, but I ran out of the corrugated brown paper I was using. Attach branches with Tacky glue or a glue gun. Allow to dry flat for several hours if using Tacky glue. 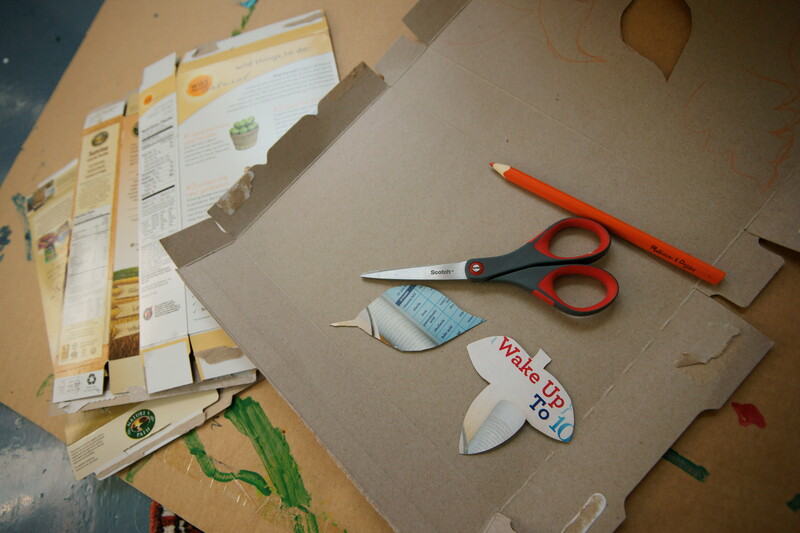 Step 5: Cut out your leaves. Obviously, with small toddlers this will just be the work of the adult, but it went pretty fast. 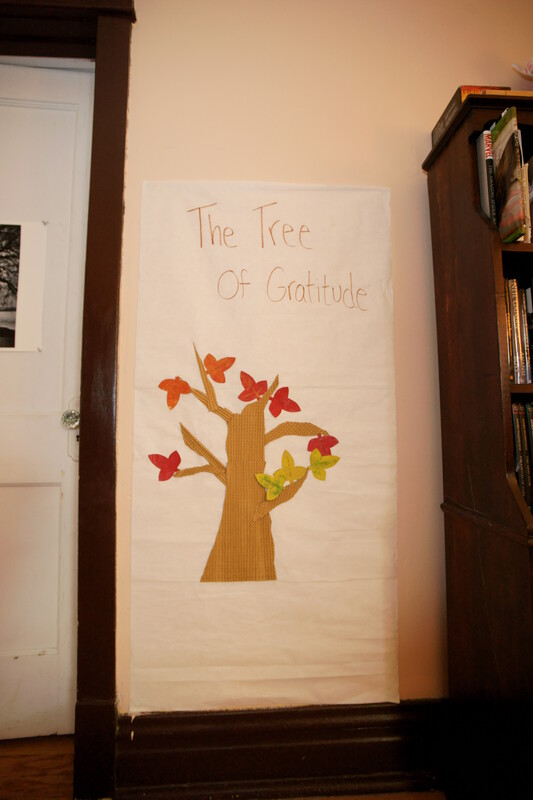 Step 6: Hang your tree where the whole family will see it, and start filling it with leaves of gratitude! I used Tacky glue to hang our tree trunk on a large piece of white paper, then attached the paper to the wall with poster putty. 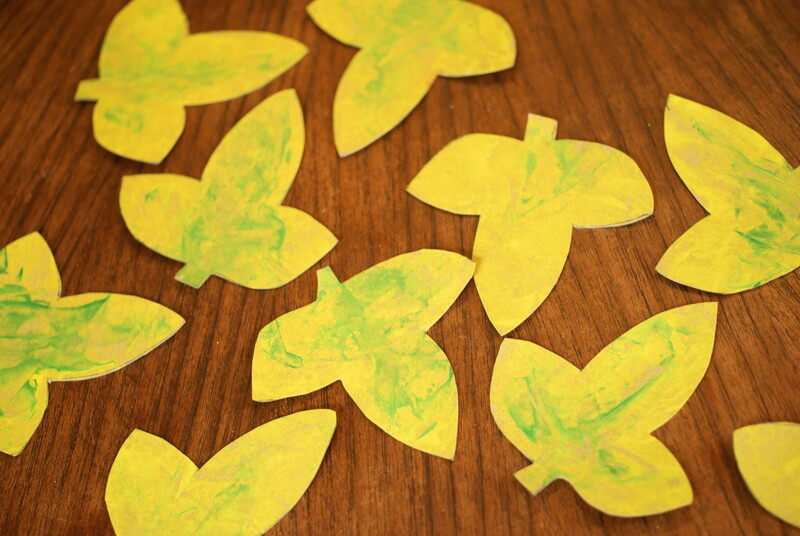 If you have lots of poster putty you could just use that to attach the tree and the individual leaves. Or tape everything to a full length window. Don’t let a lack of materials deter you from creating! 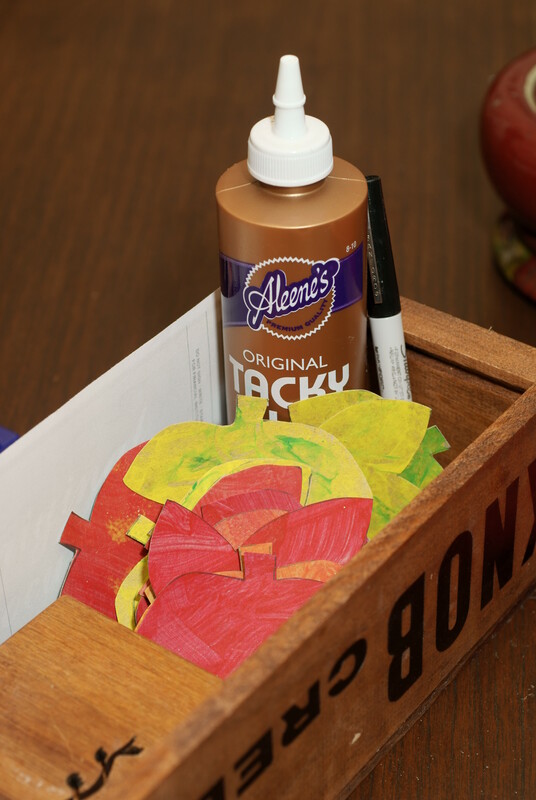 We keep our leaves, Tacky glue and a thin sharpie together on our dining room table so they’re easily accessible. Have fun and happy fall! !